Hi Chappy.....the engines i'm using have been modified to the extent of gov. removal, strait exhaust header with silencer, honda carbs with velocity tubes and filters, and micuni fuel pumps with throttle assembly installed, manifold spacers with pulse pickups, 18 lb. valve springs, and advanced timing key.....this adds up to 339$, and about 150$ for shipping and exchange and duty to Ontario....Say 500$ an engine....I'm expecting to get about the same performance as the rotax's...Hope so anyway......I found with the stock clone with no gov and a strait pipe only, I could turn a 34x12 prop to almost 4300 vs. the 4450 from the yellow clone.....Just bolt the sucker on and go,....should fly well, but maybe a little heavy. I offset my motors 7/8 in. using the same thinking as you Bob, and I switched the 4 rubber bushings from under the motor to the back plate using the same location as the 6 rotax mounts....while there is some flexing of the mounts at startup etc. it is insignificant compared to the rotax's.....doing it this way gives the nacelles a bit more shock relief, but it costs a 7/8 in. penalty for further cofg adjustment. If you can get into the eggmotor yahoo site, there is a guy, Paul Bailey of Bailey Aviation who is getting set up to manufacture various mods. for the 6.5's...he has come up with a rear mount that might be worth investigating, among other things. he has designed an intake manifold that looks like it might swing the carb. into the propwash overtop of the motor. Tried everything today to solve the engine problem,...swaped around everything including the fuel pumps, to no avail...Ended up putting it back on the stand where it runs perfectly...go figure...fuel delivery problem of some sort it now seems...I'll work on it again tomorrow. The engines in the vids. are running fine....the noise apparently overloads the camera's recording capabilities.....the silencers are quite effective, and don't choke down the engine's power, although they are rather heavy....must be close to a pound apiece. While it would be great to retain the 5 gal tank, if I can't satisfactorly solve this fuel delivery problem, I may resort to a 2 gal tank teardrop style tank mounted on the nacelles......simple and maybe 4 hrs range....I'll then have to use the main tank for ballast or move the seat back for sure ha ha. Lots of stuff to thing about, but by doing you're own motor mods., and there are lots of options and kits etc. available for not a whole lot of money, to build yourself a set of really powerful, dependable, reliable, quiet, and all the other good stuff that goes with 4 cycle engines.... and for less than a complete rotax rebuild. Probably best to use real Hondas for the keepers though. I'll snoop around to see if I can locate a set of scales like that in Can. I'm going broke paying the shipping fees from the U.S.
just a thought, but you could put a tiny 500mL tank on the nacelle, and feed it with the fuel pump from a main tank behind the seat. daffy is trying this method right now, but i think we have a venting issue. you get the gravity feed without 12 pounds of extra weight on a place in the wing where you have a large torque moment between the two long bolts. Tiger Moth Bi-planes use a hand bilge pump to lift the fuel from the lower large tank in the fuselage into the smaller overhead wing tank, of course there is a weight issue there and don't forget to top up the overhead tank ! My old My21 Cors air motor with Walbro carb had a hand pump same as the ones you find in small boats it worked very well and kept the feul to the carb all day before needing another squeeze, the set up pressurised the feul tank. What about raising the tank in your Lazair 6inchs or so and see what happens? Hi Guys....It seems that the rough engine is carb jet related and not the fuel pumps or ths supply lines....I have adjustable fuel pressure regulators ordered, and I'm hoping that they will control the lower speed flooding......Thanks for your suggestions...it gets rather frustrating when things don't work right!....I'm thinking the main tank will work alright afterall. Hi Chappy...Finally got a chance to get back at the motor again...It turns out that the very inside gasket, the one that seems to be fused to the black plastic spacer, was missing....I suspect it was shipped that way and I was leaving that piece in place any of the times I had the carb off....put on the one off the princess motor and I'm back in business....Hate to think of the hours I spent trying different things and even one day with Glen Dewsbury helping brainstorm the problem. I've got little fuel pressure regulators ordered to drop the pressure down a bit to stop the flooding at idle and after that it just remains to tidy up the new wires,cables, and gas lines with cable loom, install the new panel with new tinytachs and ignition switches etc. and check the C of G and inspect the whole plane, change the air in the tires har har, and wait for my strip to dry up. 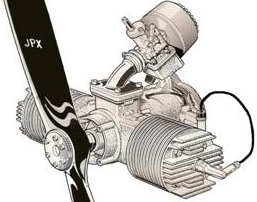 I hadn't thought about the adjustable needle jets, but the honda jets I have with the 140 e tubes seem to work fine....I also have the honda carbs rather than the clone ones....the one engine with about 15 hrs on it now cranked up 4560 rpm the other day swinging the 12x34 prop. Moving along slowly, but moving. I bought two more blue motors from Horrible Freight this weekend while they were $89 each. Most of my metal stock has come in and so have the missing tools I need for making some real aluminum prop hubs. I have the engine parts ($$) on order for my test engine and they should show up soon. I had hoped to build a new design engine mount last week but had to defer to other more pressing obligations. I'm hoping to get to it and/or the prop hub by the end of the week. Spring has finally sprung after an extraordinarily awful winter here. It has left us with an unusual amount of cleanup and repair work so the engine project will have to get sandwiched in between as I go. Plus, I'm slow nowadays. I just had an interesting conversation with the owner of one of the larger internet Honda and clone Go-Kart parts suppliers. He told me that the biggest problem they are finding with the clones is high speed engine vibration which beats the engines up pretty fast. On hopped up engines, he says where one might expect a clone engine to last a season, the Honda will last for many. Fortunately, we won't be seeing the high rpm's they run at. He says that with the prices of the Honda engines recently coming down so much - the GX200 now available for just a tad over $300 - that they are recommending the Hondas. BTW, the Honda engines are no longer built in Japan, but in Thailand. I still plan on testing with the blues and see how they perform, and also how well my engine mount suppresses vibration. As most of the expensive modification parts will swap right out into the Honda, I can upgrade later if I'm happy with the performance. And I have stuff here that can use the clones as replacements for their old, tired B&S and Tecumseh engines, so little waste there. Glad to hear you have the fuel mixture problem solved. Looking forward to your first flight report! For those who are interested in my remotor project...I got a chance to get the plane hoisted up by the tube today, and found it balances level at 15''with me in the seat and 1/4 tank of gas...This really surprised me because I felt the c of g would have been further ahead based on the way it flew....level flight at 45mph with no back pressure on the stick.....felt I could use a little more back stick on landing flare but not available....and now with the added 12 lbs. forward to compound this I felt sure I would have to make some adjustment. The weight of the plane with the pod and new motors is 248 lbs.....that also surprised me until.....original weight with bi props 225 lbs. and then added.....new motors +14lbs . plus pod, plus instruments, plus wheel pants,....9lbs? probably more....and then my 160lbs. to bring it up to 410lbs. According to the chart that Shannon posted, I should have 25lbs under the tail with boom level and with me in the seat. I am showing 29lbs......It appears I have a tail heavy situation, but I know it flys great with the rotax's and the pod, and with the 12lb. increase forward it should help the tail heavyness a little bit.....I'm wondering if the fact that being my plane is covered with fabric, if there is a bit of additional weight over the tedlar....and this being behind the c of g and showing up in a static test like this and skewing the tail weight....this should not be apparent when the wing is flying.....could I be right in my thinking?....that might explain the balance at 15'' on the boom. Pete did you also do a normal Series III Balance check with the plane on the ground, half tank of fuel, and you in the plane ? As I understand it your results were only with the hang test. Do you know if your fabric is the certified 2.7oz or the lightweight 1.7oz ? Also is the covering sealed, coated and painted (auto paint) using a normal type process or with another method (latex paint). About the only thing I can add is that possibly with your light weight you do not contribute to a bad CG conditon. If everthing looks good according to the factory numbers then I'd say no problem is present.